Recently, an article in the Journal of Otolaryngology, Head and Neck Surgery, extrapolated data from a County hospital in Minnesota and calculated a national cost of inpatient hospital care for odontogenic deep neck space infections to be $200 million annually (1). Absent from this article was any mention of the cost or incidence of odontogenic rhinosinusitis. The reported incidence in the literature of dental pathology as a cause of rhinosinusitis is 10-12% (2). The primary source data for this incidence is from the 1950s and there is no documentation in the referenced articles of the data used to calculate this incidence. Therefore, the true incidence odontogenic rhinosinusitis is unknown and, based on my experience, most likely underappreciated. Prior to reviewing odontogenic rhinosinusitis, we need to discuss common definitions. Rhinosinusitis is inflammation of the paranasal sinus and/or nasal cavities. This inflammation may be caused by allergic, infectious or immunogenic etiologies. Acute rhinosinusitis lasts up to 4 weeks, subacute rhinosinusitis lasts up to 12 weeks, and chronic rhinosinusitis lasts greater than 12 weeks. Acute rhinosinusitis is a clinical diagnosis based on the history and physical exam. Symptoms of sinusitis have been divided among major and minor factors (3). The diagnosis requires either two major factors or one major factor and 2 minor factors. Major factors include facial pain, facial congestion, nasal obstruction (blockage), purulent (discolored) nasal drainage (anterior or posterior), lack of or absence of smell, or fever. Minor symptoms include headache, fatigue, halitosis (bad breath), and dental pain, cough or ear pressure or pain. Odontogenic rhinosinusitis is defined as sinusitis induced by a dental lesion. The common etiologies include periapical and periodontal disease, odontogenic lesions and iatrogenic and traumatic causes. Iatrogenic causes include complications of tooth extractions, implants, sinus augmentation, osteotomies and other orthodontic surgery, and a foreign body reaction to either the root canal sealant or filling material used in root canal therapy. A significant amount of literature is dedicated to complications associated with dental implants and sinus lifts. The reported incidence of rhinosinusitis resulting from sinus augmentation is 0-27% (4). However, when strict criteria are used to define rhinosinusitis, the incidence is 4.5%. Approximately 1/3 of these patients will progress from acute to chronic rhinosinusitis. Chronic rhinosinusitis requiring surgical intervention from sinus augmentation is reported to be 1.3% of patients(4). Sinus inflammation consisting of mucous membrane thickening on preaugmentation CT imaging is a statistically significant risk factor for post procedure acute or chronic rhinosinusitis (5). These are patients who would benefit from a preaugmentation ENT evaluation. Treatment of sinusitis consists of saline irrigations, topical and systemic decongestants, antibiotics, topical and systemic steroids and allergy treatment. Antibiotics are used to treat acute rhinosinusitis and acute exacerbations of chronic rhinosinusitis. The specific antibiotic used is based on common microbiology patterns or the result of endoscopically-guided cultures. Recommended first-line antibiotics include Augmentin, high-dose amoxicillin, and extended spectrum cephalosporins. 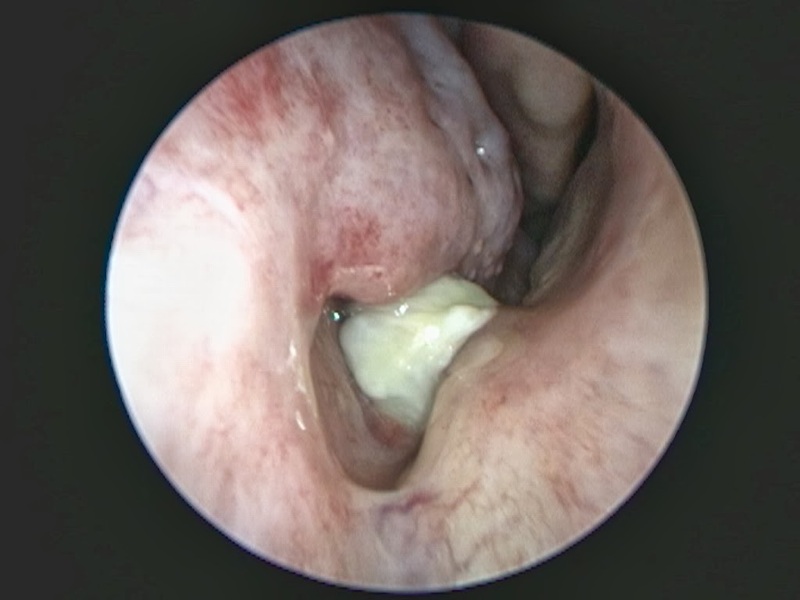 Surgery for acute or chronic rhinosinusitis is usually a last resort after maximal medical therapy has failed. 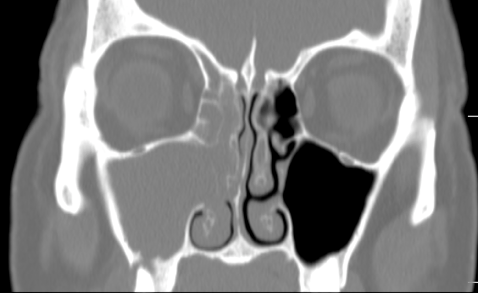 Odontogenic rhinosinusitis presents a unique challenge to the otolaryngologist. The diagnosis is frequently delayed. A dental source for the sinus infection is frequently not considered until after both medical and surgical therapy has failed to resolve the patient's symptoms and radiographic disease. A primary cause for the delay in diagnosis is the failure of the radiologist and ENT physician to adequately assess dental pathology on CT imaging. In a 2010 retrospective case series involving 21 patients with known odontogenic rhinosinusitis, the initial radiology report failed to mention radiographic findings of dental pathology in 14 or 67% percent of the patients (6). There are symptoms which suggest an odontogenic source for the infection in patient presenting with rhinosinusitis. 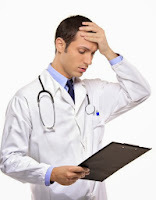 First, the large majority of patients will present with unilateral symptoms. This means that the patient will complain of nasal discharge, cheek pain, dental pain or nasal obstruction primarily on one side. Another unique symptom to odontogenic rhinosinusitis is a foul smell noted by the patient. In 76 patients with known odontogenic rhinosinusitis, 33 or 43% reported a foul smell (6,7,8). 1. A complications of rhinosinusitis requiring emergent surgery. 2. Sinus surgery in an infected maxillary sinus performed prior to closure of an oral antral fistula to increase the chance of success. 3. Sinus surgery for pre-existing sinus disease prior to sinus augmentation (9). The most important aspect of successful treatment consists of good coordination of care and communication between the dentist and ENT physician. A 51 year old female presents with one year of left facial & tooth pain, left nasal obstruction, postnasal drainage and headaches. Past dental history is significant for RCT of teeth 10 & 11, apicoectomy of tooth #10, and dental implants #12 & 13. The implants failed and she developed an oral antral fistula after removal of the implants and debridement of necrotic bone. 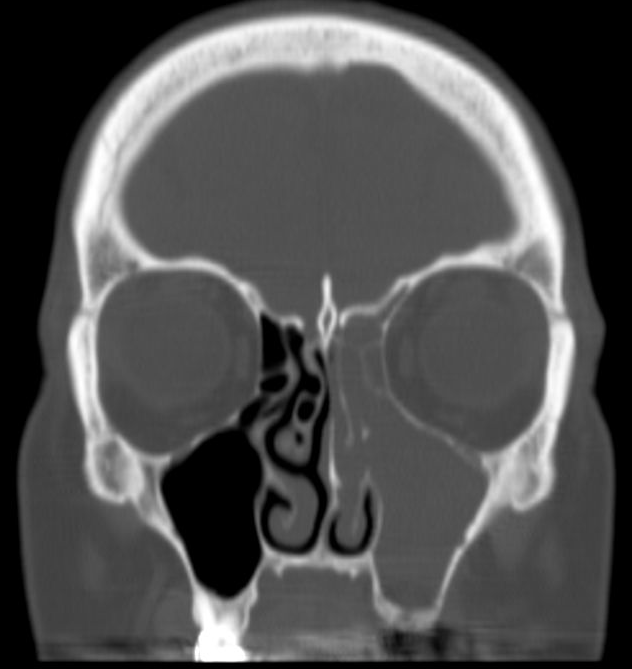 Coronal CT image demonstrating severe left maxillary and ethmoid sinus disease. 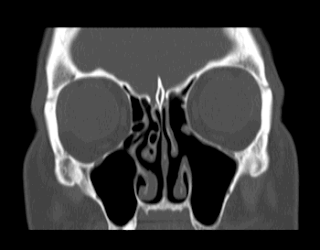 This one sided sinus disease was of odontogenic origin. 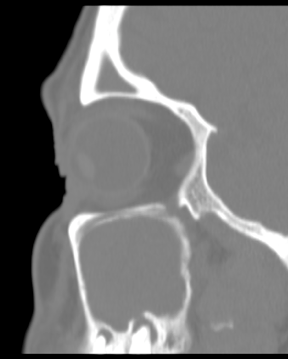 A coronal CT 2 months after ethmoid and maxillary sinus surgery showing complete resolution of sinus disease. 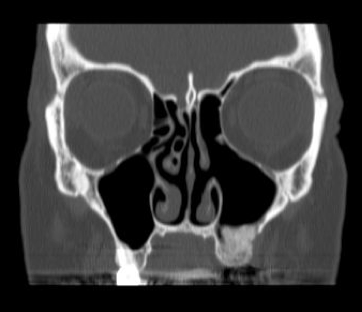 Several months later, she underwent a successful sinus lift with implantation and a coronal CT image demonstrating ossification of the sinus augmentation. A 70 year old male with postnasal drainage presents with a right nasal cavity mass demonstrated on nasal endoscopy. A yellow discharge is associated with the object. 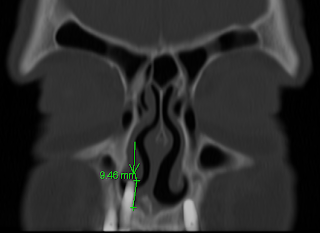 A coronal CT image demonstrates extrusion of a dental implant 9.5mm into the right nasal cavity. Additional implants extruding into the maxillary sinuses without radiographic disease. A 69 year old female presents with 12 months of brown-yellow nasal drainage, mild right facial pressure, right nasal congestion and a foul taste and smell. She presented to her general dentist 3 months prior to her ENT consultation with a right gingival buccal lesion that resolved with clindamycin. A coronal CT image of the paranasal sinuses demonstrates maxillary and ethmoid sinusitis ipsilateral to right maxillary periapical tooth disease with buccal plate and maxillary sinus floor boney erosion. A sagittal image through the right maxillary sinus shows periapical disease of teeth #2 and 3. This is another odontogenic sinusitis requiring dental treatment as the initial treatment for her sinus problem. 1. Morbidity and cost of odontogenic infections. Eisler L, Wearda K, Romatoski K, Odland RM. Otolaryngol Head Neck Surg. 2013 Jul;149(1):84-8. 2. 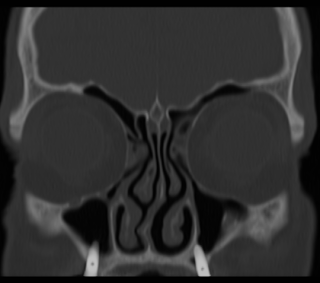 Clinical aspects of odontogenic maxillary sinusitis: a case series. Longhini AB. Ferguson BJ. International Forum of Allergy & Rhinology. 1(5):409-15, 2011 Sep-Oct.
3. Lanza DC, Kennedy DW. Adult rhinosinusitis defined. Otolaryngol Head Neck Surg 1997;117:S1-7. 4. ENT assessment in the integrated management of candidate for (maxillary) sinus lift. Pignataro L, Mantovani M, Torretta S, et al. ActaOto rhino laryngolItal 28:110–119, 2008. 5. 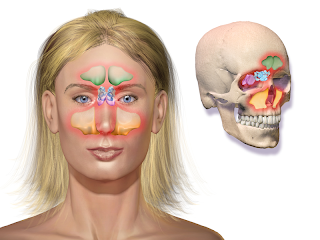 Late signs and symptoms of maxillary sinusitis after sinus augmentation. Manor Y, Mardinger O, Bietlitum I, et al.OralSurg Oral Med Oral Pathol Oral RadiolEndod 110:e1–e4, 2010. 6. Clinical aspects of odontogenic maxillary sinusitis: a case series. Longhini AB. Ferguson BJ. International Forum of Allergy & Rhinology. 1(5):409-15, 2011 Sep-Oct.
7. Microbiology of acute and chronic maxillary sinusitis associated with an odontogenic origin. Brook I. Laryngoscope. 115(5):823--‐5, 2005 May. 8. 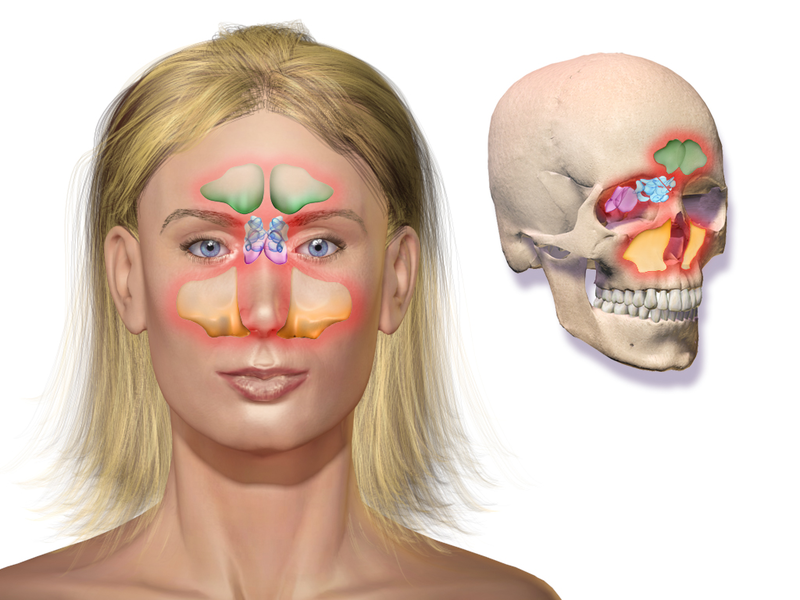 Late signs and symptoms of maxillary Sinusitis after Sinus augmentation. Manor Y, Mardinger O, Bietlitum I, et al. Oral Surg Oral Med Oral Pathol Oral RadiolEndod 110:e1-e4, 2010. 9. The characteristics and new treatment paradigm of dental implant-related chronic rhinosinusitis. Chen YW, Huang CC, Chang PH, Chen CW, Wu CC, Fu CH, Lee TJ. Am J Rhinol Allergy. 2013 May;27(3):237-44. The thing that a lot of people don't know about postnasal drips (as seen in one of the pictures of the 70 yr old man's nasal cavity) is that can often be a cause for bad breath. As a Park Ridge Dentist I have had a few patients with this problem.